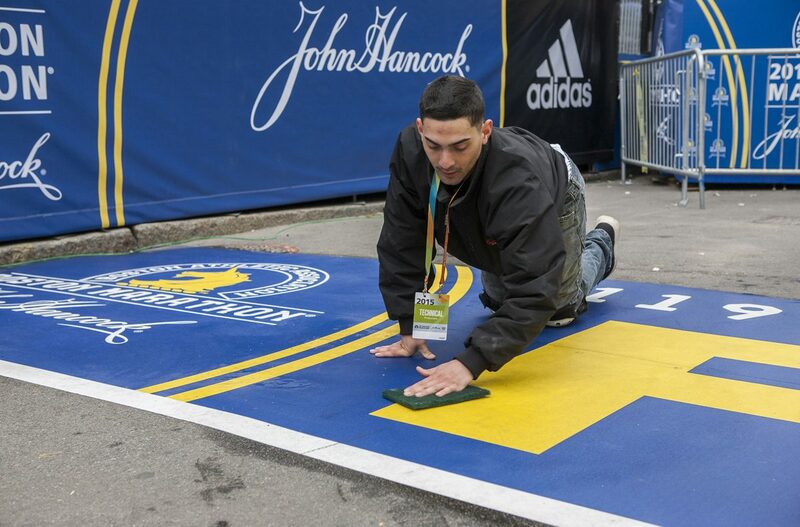 Keep up with the 119th Boston Marathon as we update you throughout Marathon Monday. 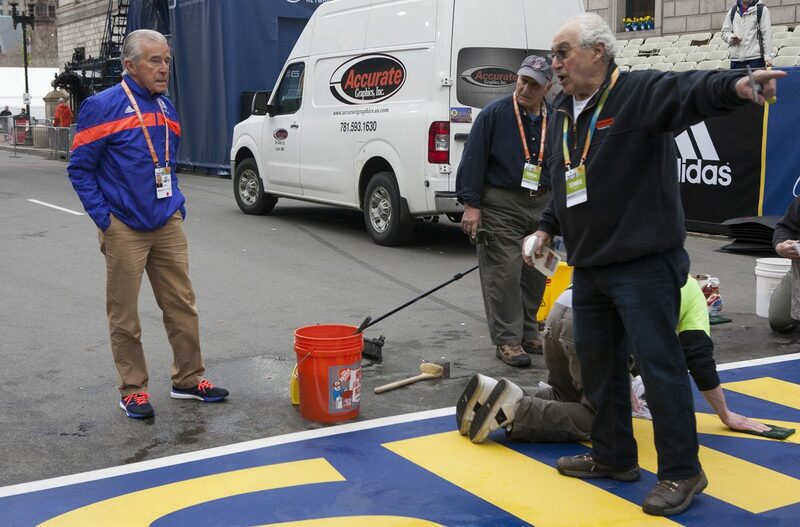 At about 5:25 p.m., officials turned off the clock, but runners are still hustling to finish the race—because that’s what we do, right Boston? 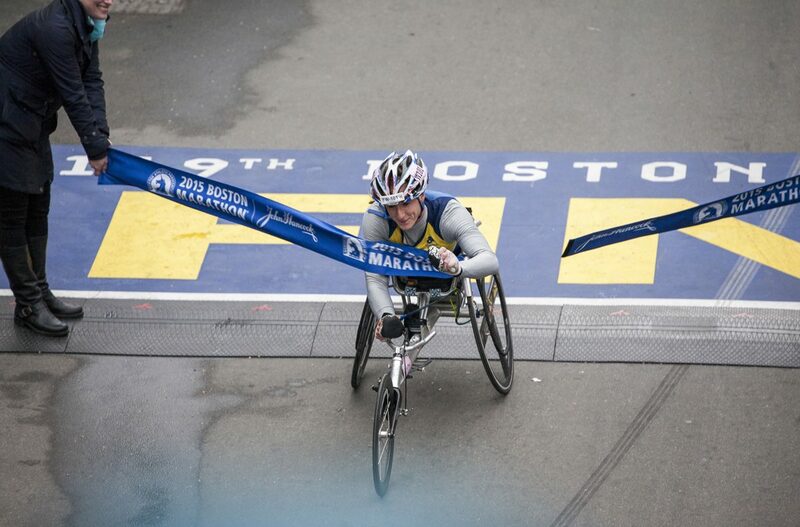 Congratulations to all of the participants in the 119th Boston Marathon. What a wet and wild ride it was. Rain? What rain? 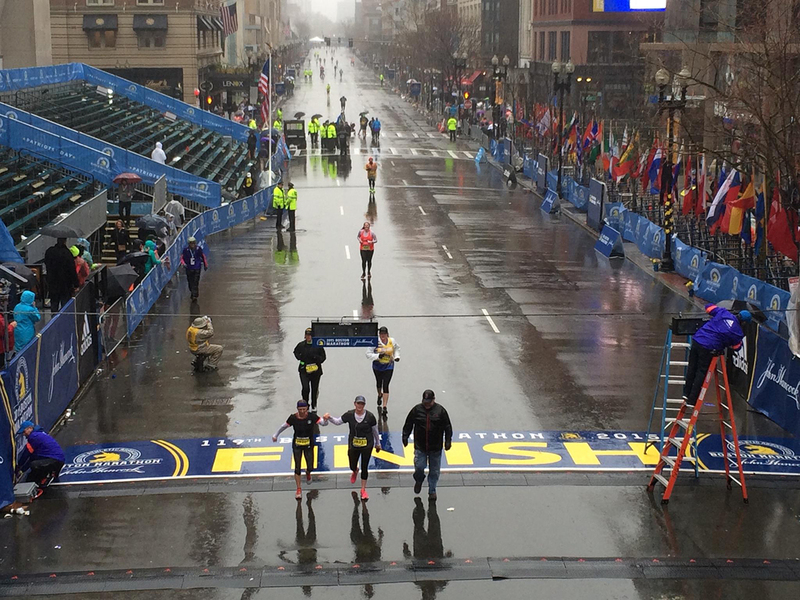 Despite heavy downpours, runners were still making their way to Boylston Street late this afternoon to finish the race. 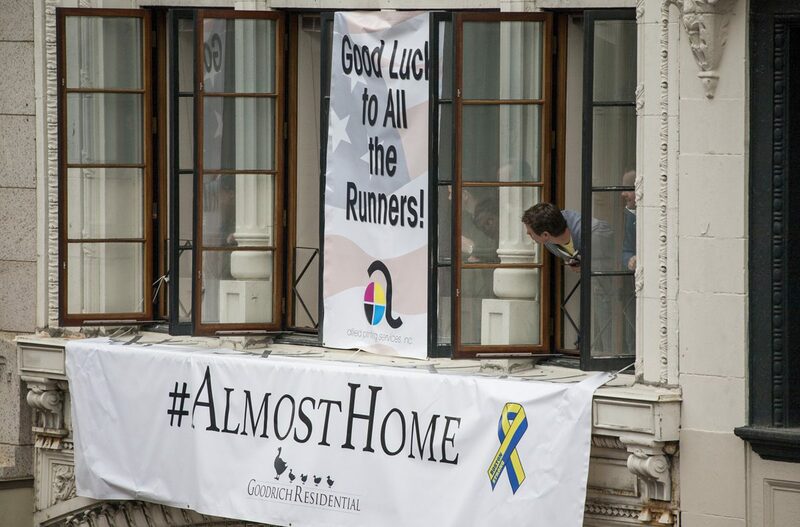 A quick update on the celebrity runners: Sean Astin clocked in at 04:49:53, with Uzo Aduba not far behind at 05:03:24. 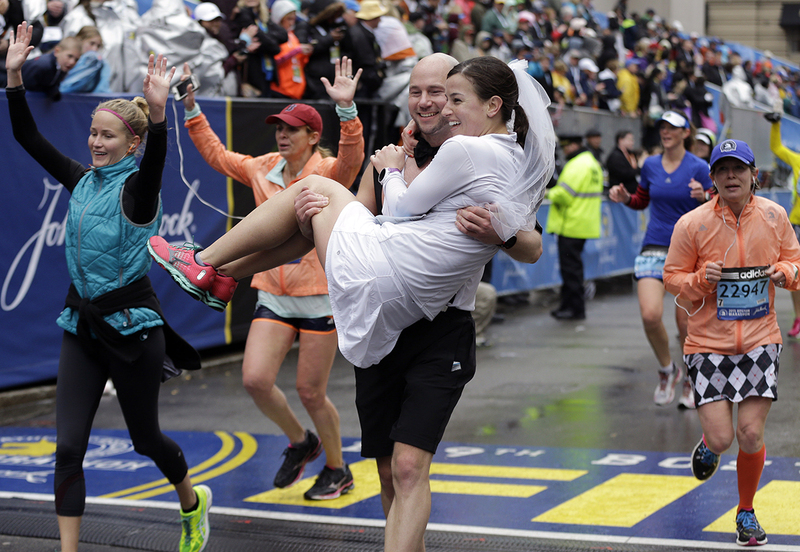 Ross Cockerham carried his bride-to-be Ansley Proctor, clad in pink running shoes and a runner’s take on a wedding gown, over the finish line. 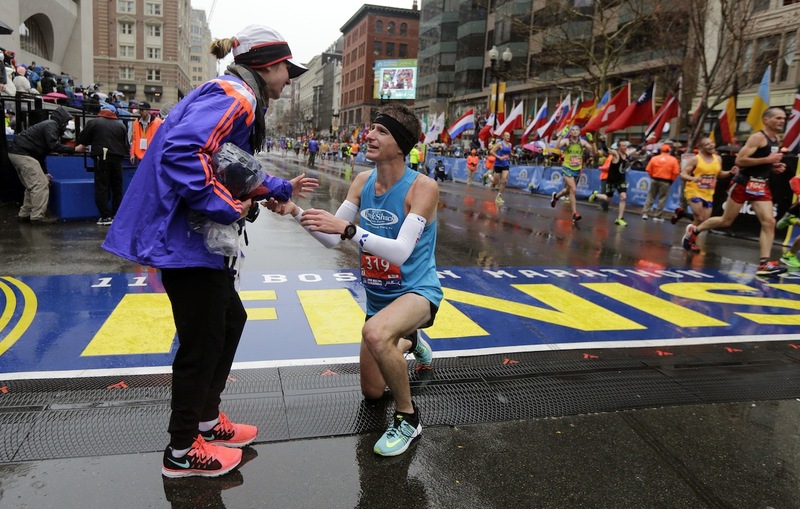 The couple, who made the trek to Boston from Columbia, Md., will take their vows on Saturday. Don’t you mean good paws? 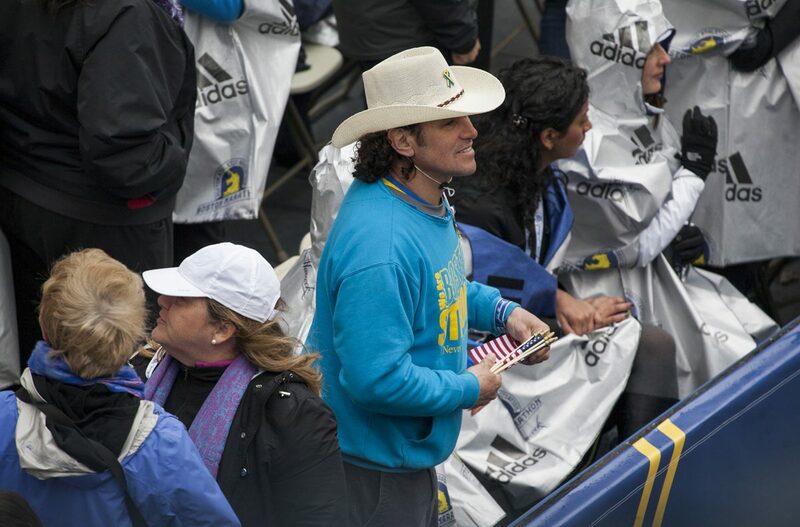 3:55 p.m. Keep your eye out for two celebs running the Boston Marathon today. 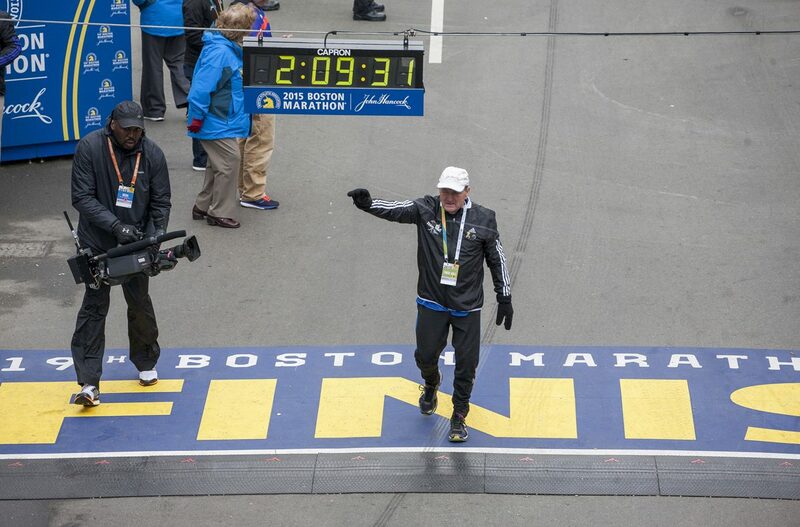 One is Sean Astin (BIB #25420) of Lord of the Rings, who is running with Team MR8. The other is Uzo Aduba of Orange Is the New Black, running with Dana-Farber Cancer Institute. We chatted with Aduba last week to ask about OITNB Season 3, favorite eateries in Medfield, and running track and field at BU. 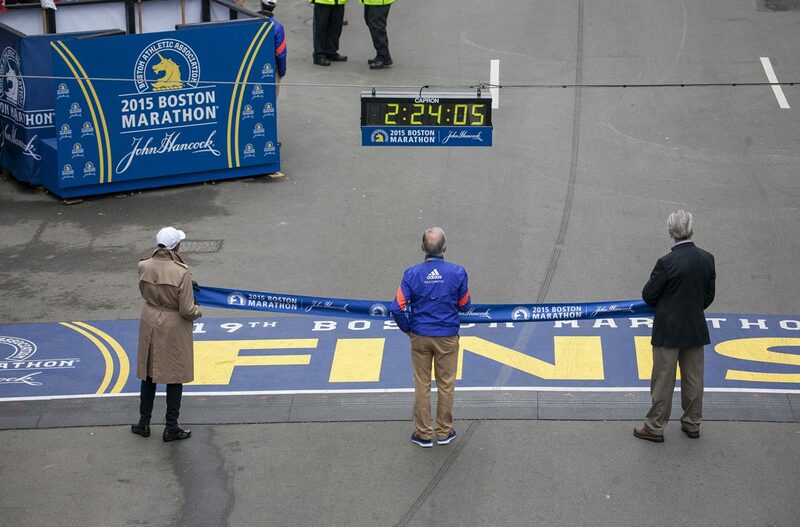 3:20 p.m.
Do you want to run a marathon? 2:52 p.m. Norm! Spotted in Kenmore Square, perhaps on his way to Cornwall’s? 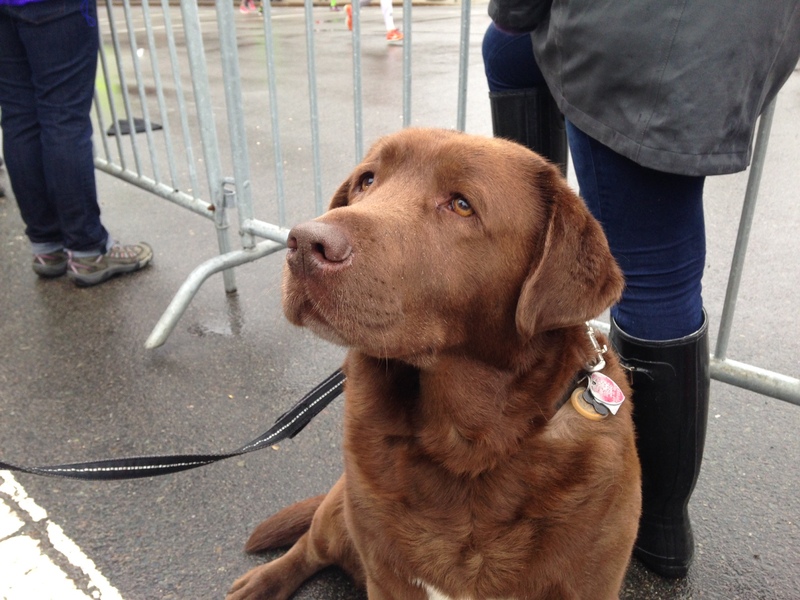 Myles looks on wistfully, dreaming of the day the BAA will welcome his kind with open arms and kibble. 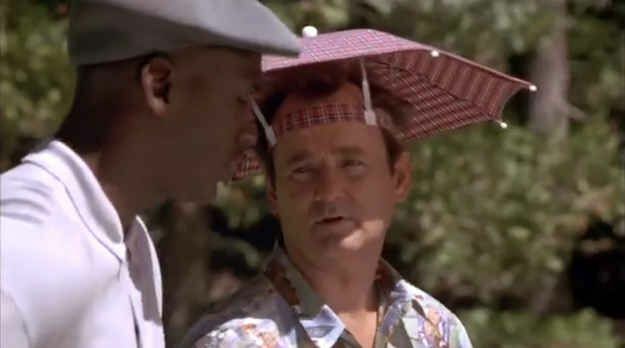 2:10 p.m.
Lila Slymon has the only logical attire for today’s dreary condition, making Space Jam-era Bill Murray proud as she hands out water for Team Brookline. 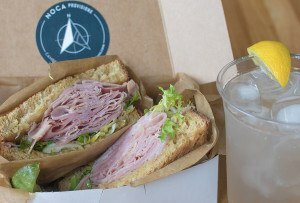 12:55 p.m. 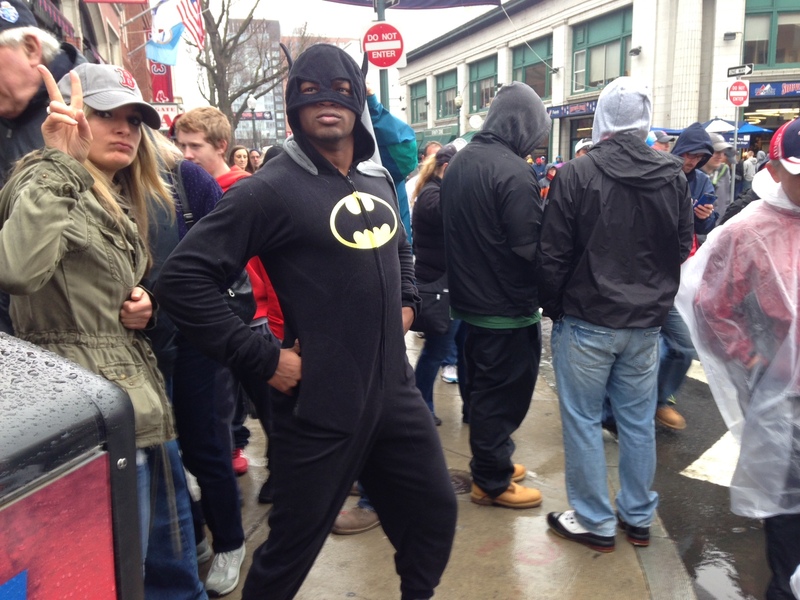 Defending Boston Marathon champ Meb Keflezighi wasn’t first across the finish line this year, but he gets points for style. 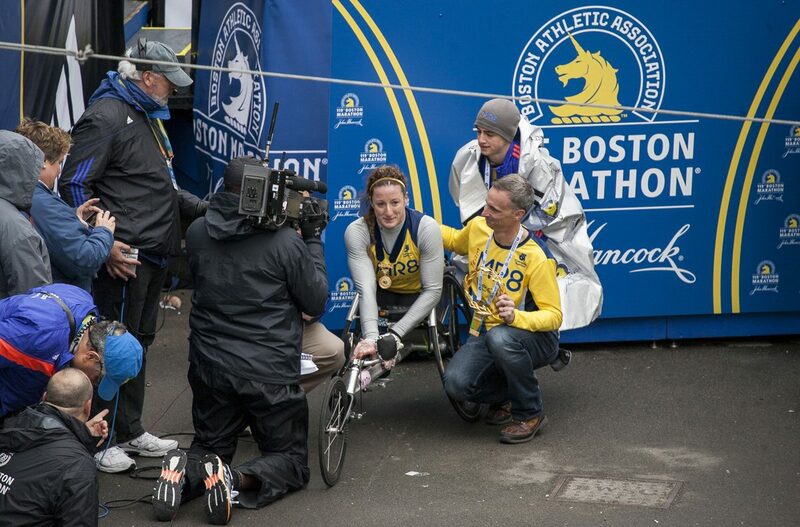 As he crossed, he caught up with Charlestown native Hillary Dionne, then reached out and grabbed her hand and lifted it up for a photo finish. 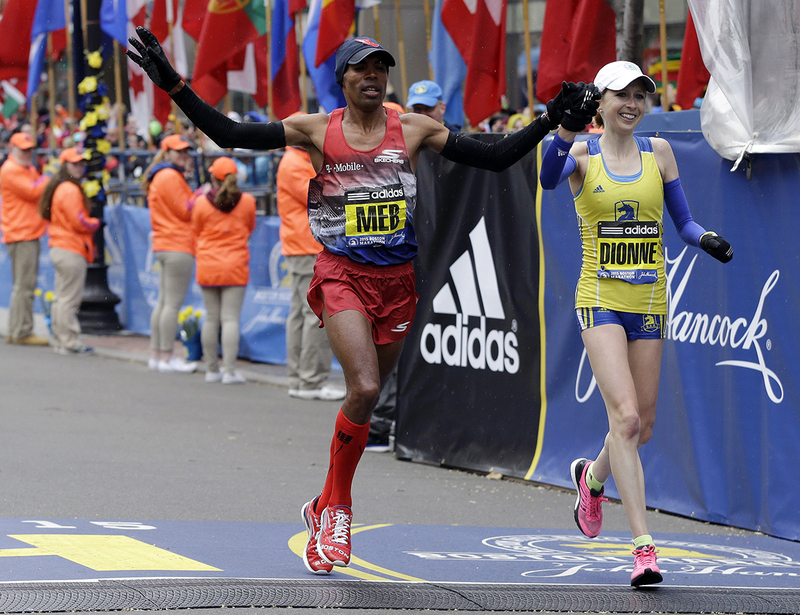 Last year, Meb became the first American to win the race in over 30 years. 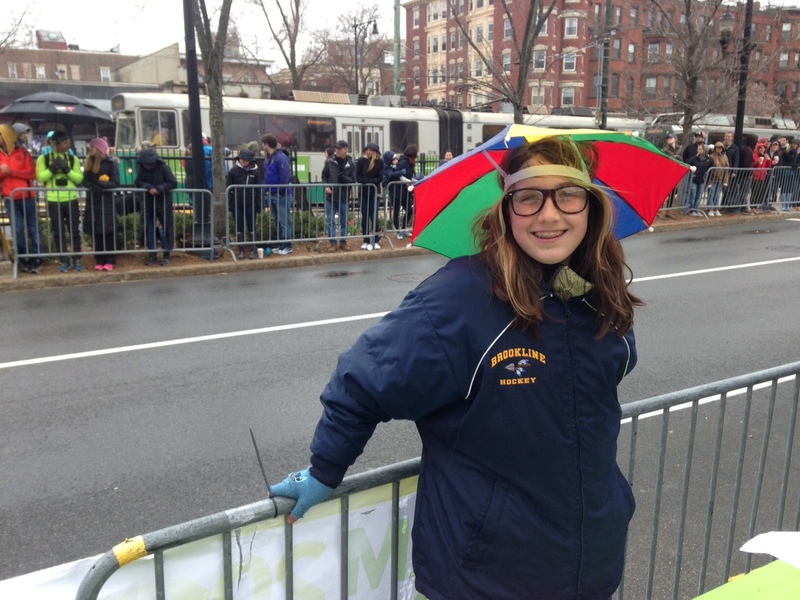 It takes a special kind of hardiness to stand outside in sketchy weather and cheer on the winners. Luckily, this guy’s got it. 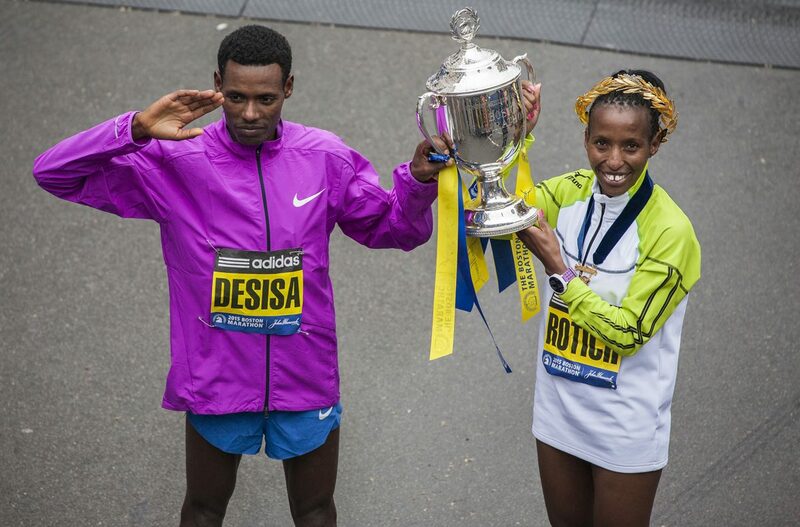 12:10 p.m. Lelisa Desisa crossed the finish line to win the men’s race by a good margin after a final mile that exhibited somewhat less suspense than the tight women’s race. 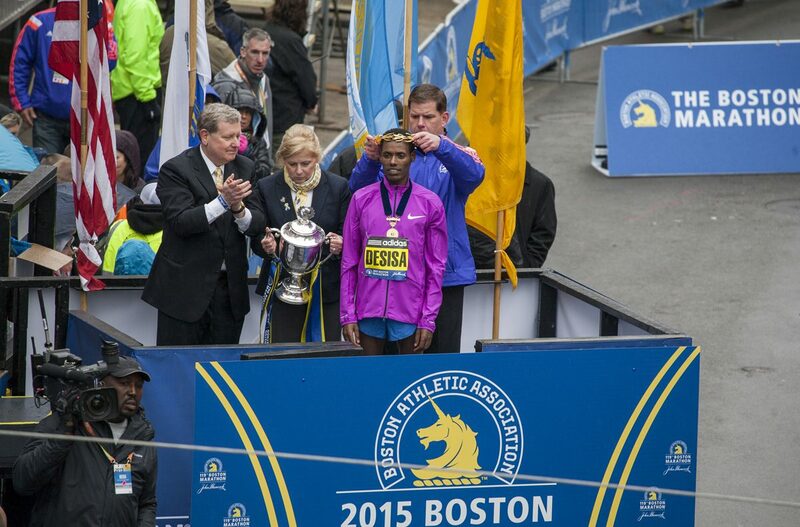 Desisa won the 2013 marathon and donated his medal to the city of Boston to memorialize that year’s attacks. Happily, he’s added another one to his collection. 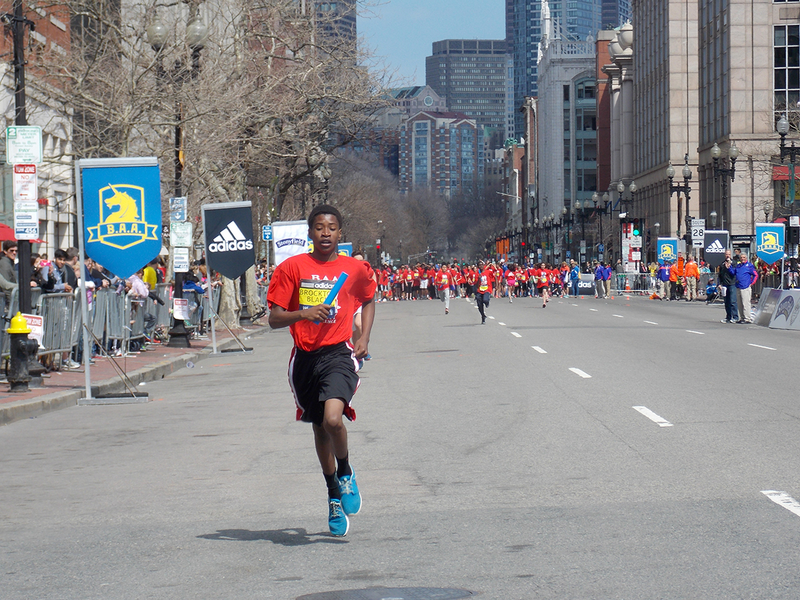 Yemane Adhane Tsegay took second place. 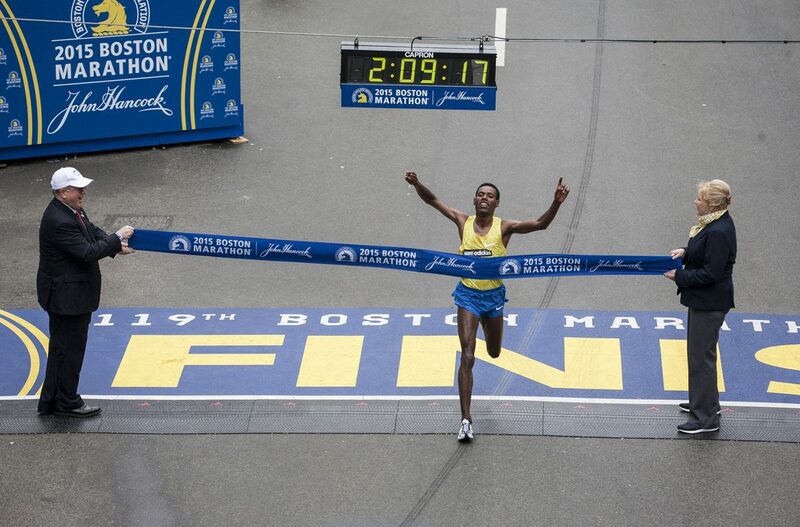 Wilson Chebet placed third. American Dathan Ritzenhein took seventh after leading the race for a good distance. 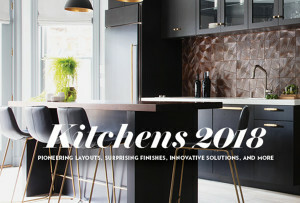 Check out all the winners here. 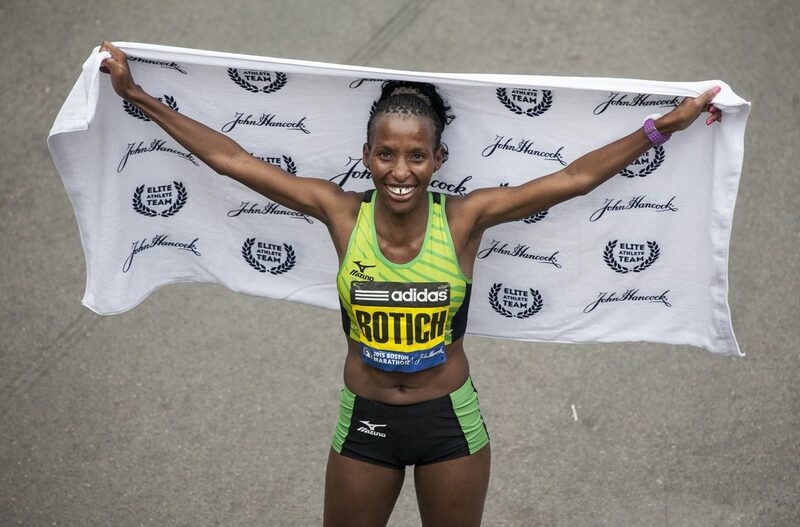 12 p.m. Caroline Rotich wins the women’s elite race after a breathtaking battle to the end with Mare Dibaba. Desiree Linden took a strong fourth place. 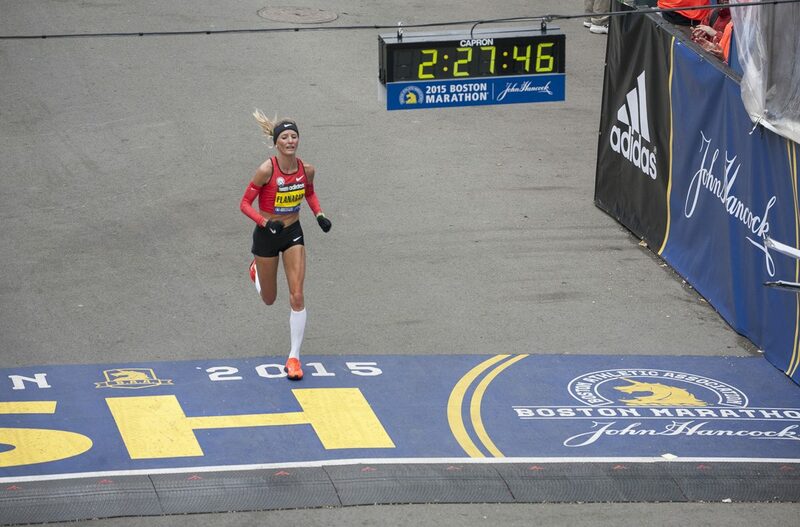 Marblehead native Shalane Flanagan placed ninth after falling off the leaders’ pace in the hills. 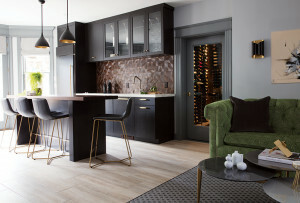 Check out all the winners here. 11:52 a.m. 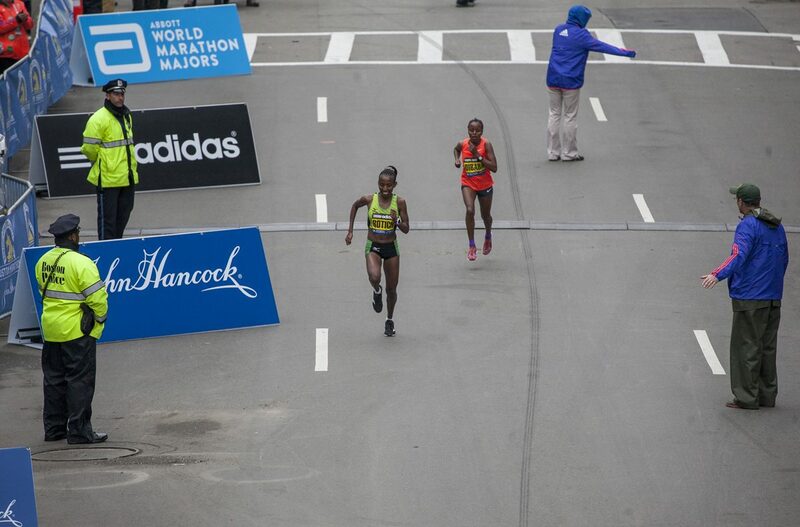 Heading into the final mile, three women have significantly picked up the pace. 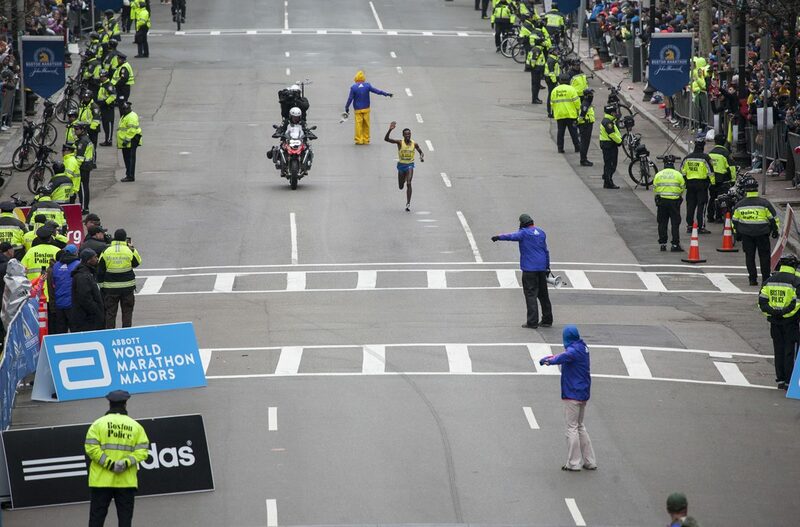 They are Mare Dibaba, Buzunesh Deba, and Caroline Rotich. 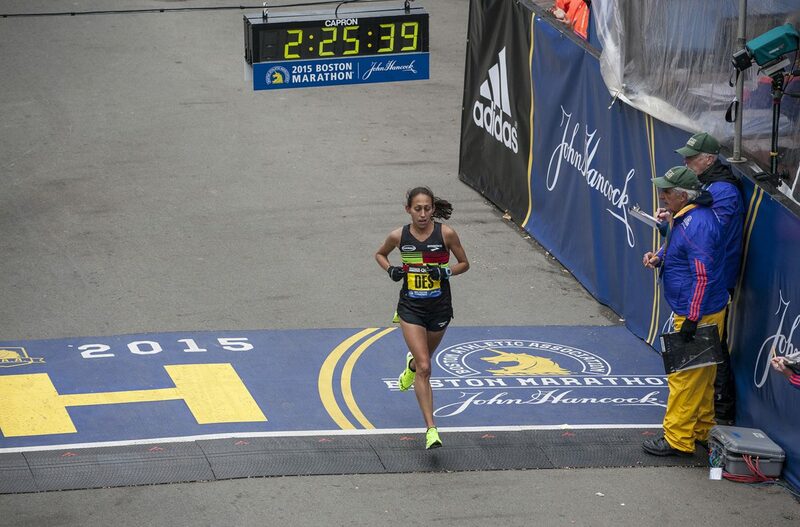 American Desiree Linden is in a distant fourth. 11:49 a.m. 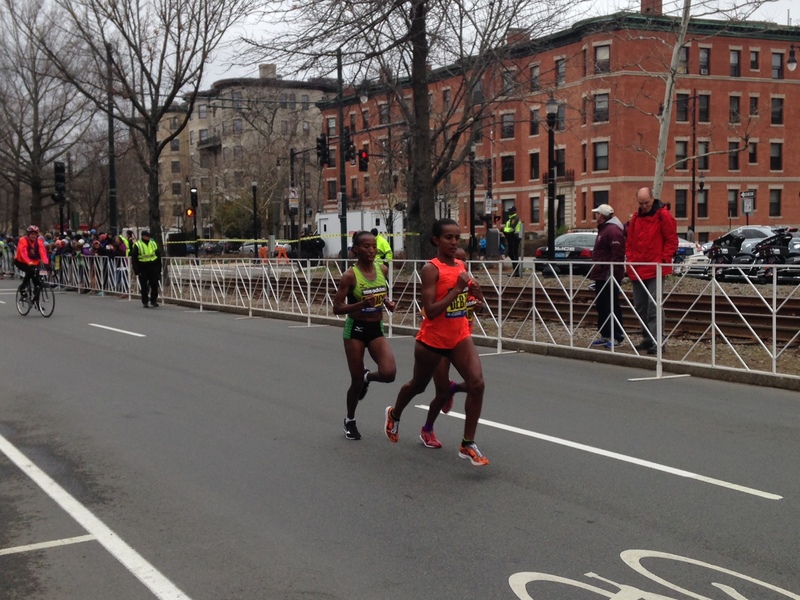 The frontrunners in the women’s elite race make their way through Audubon Circle. 11:35 a.m. Elite Americans are so far having a great race, with U.S. runners briefly leading both the men and the women. Michigan’s Dathan Ritzenhein leads the men while Desiree Linden battles for her spot out in front of the women. Both had high profiles coming into today. 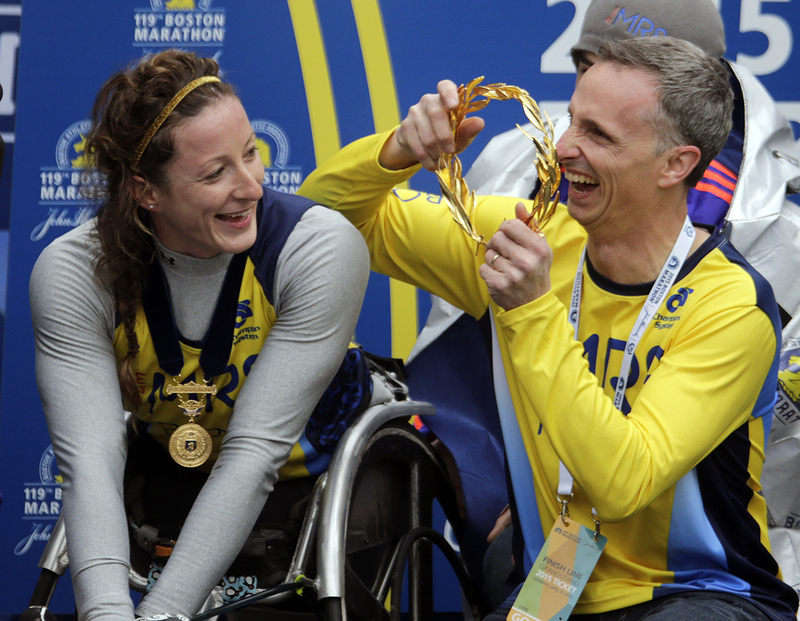 Ritzenhein is a three-time Olympian and Linden was the top American woman at the New York Marathon. 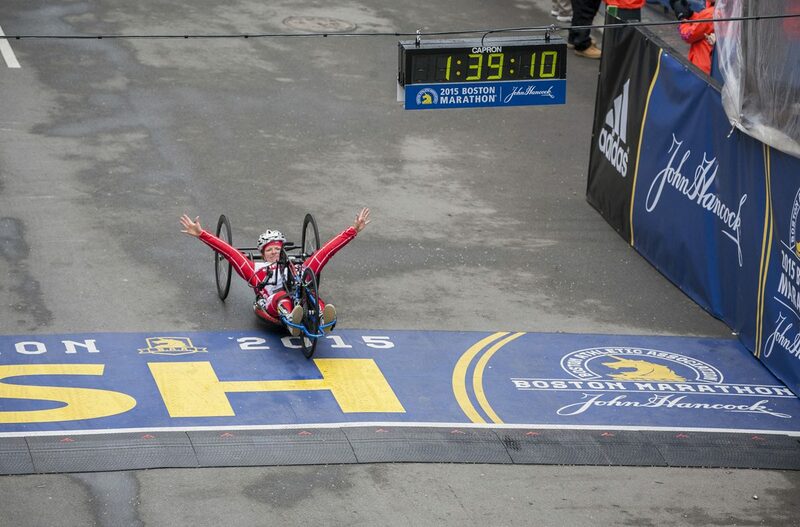 11:12 a.m. Tatyana McFadden has followed up her 2013 and 2014 victories with a 2015 win in the women’s pushrim race, crossing the finish line in 1:52:54. This is her third win. McFadden, by the way, wears the number 8 on her back to honor the memory of 8-year-old Marathon bombing Martin Richard. 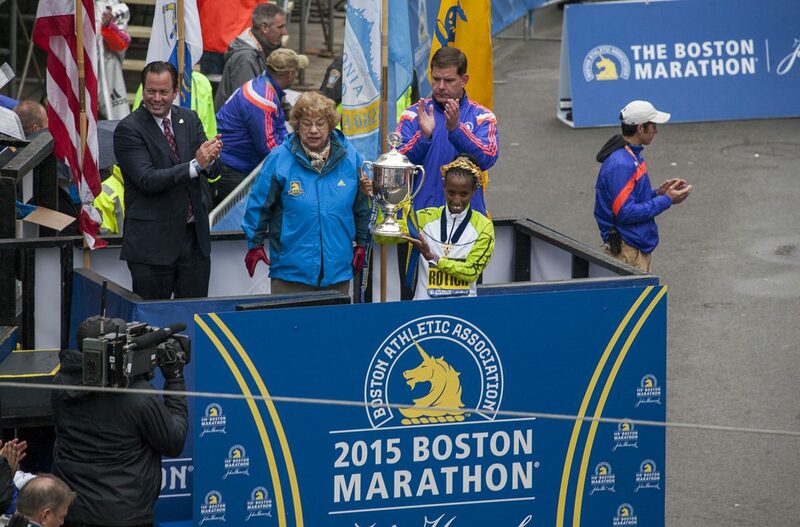 You can track the winners and their official results here. 11:06 a.m. 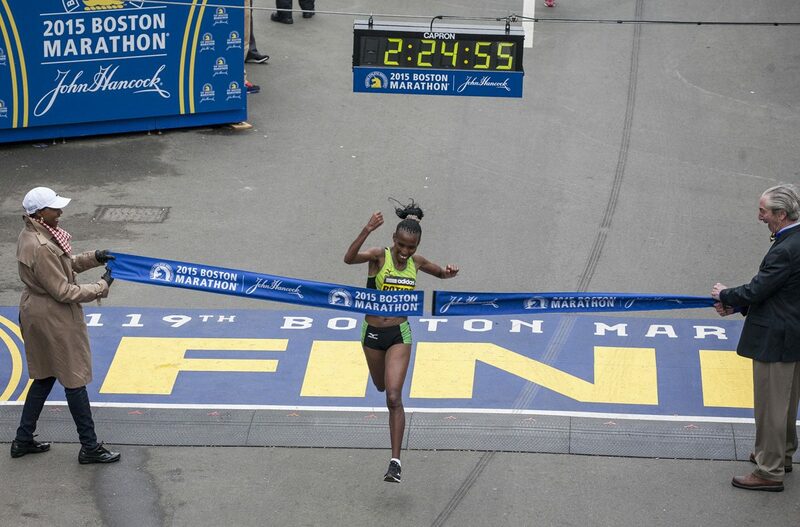 The elite women hit the half marathon mark with Caroline Kilel of Kenya in the lead at 1:12:44. U.S. favorite Shalane Flanagan is among the leaders, just a second behind. 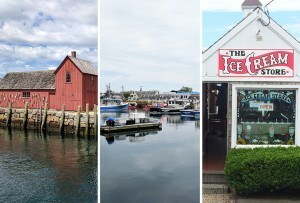 10:55 a.m. The elite runners may have avoided a wet start, but it is officially raining in Hopkinton as the third and fourth waves get their start in the race. Hey, at least they won’t be standing around anymore. And we have our first winner. Men’s pushrim competitor Marcel Hug of Switzerland unseated defending champion Ernst Van Dyke. 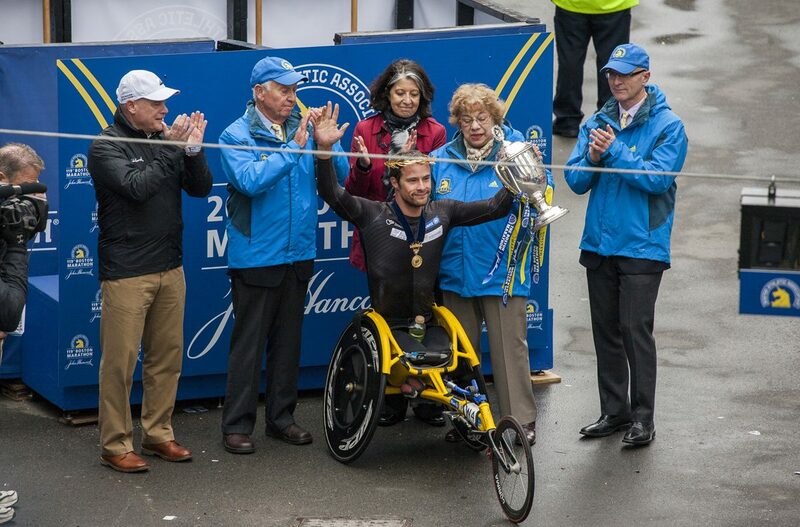 Van Dyke has won the race 10 times, but it was Hug who crossed the finish line first this year with an unofficial time of 1:29:54. Hot dogs, in fact, are one of the few foods perfectly acceptable for breakfast, lunch, and dinner. 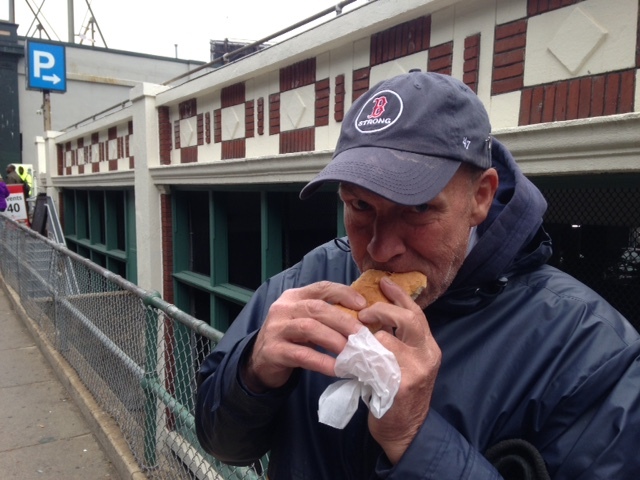 Crowds are spilling into Fenway, where the Red Sox are set to face the Baltimore Orioles in a little under an hour. The first wave of runners has left the starting line, with the elite men leading them. 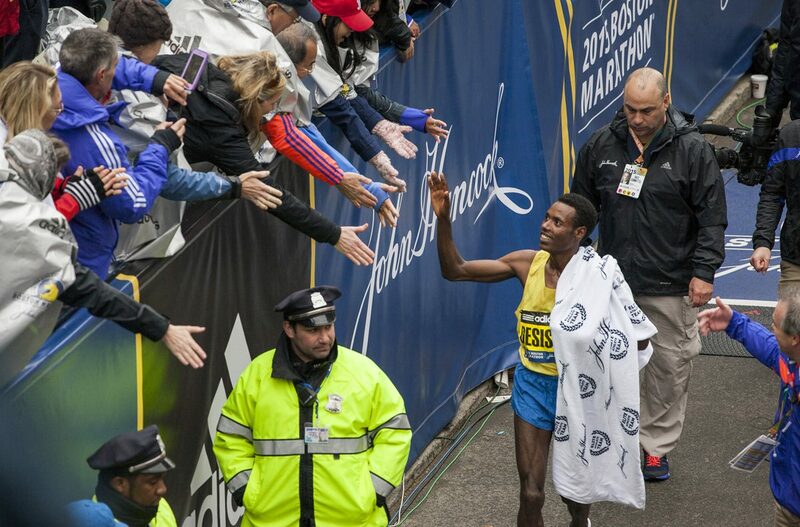 Among that group is defending champion Meb Keflezighi, the first American man to win the race since 1983. 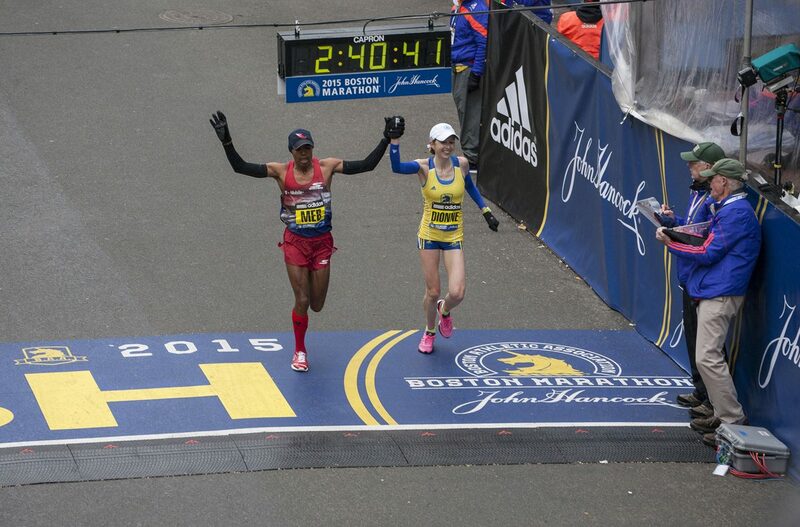 As you may notice from his presence on all kinds of ads, Meb’s star has risen in a big way since his win last year. 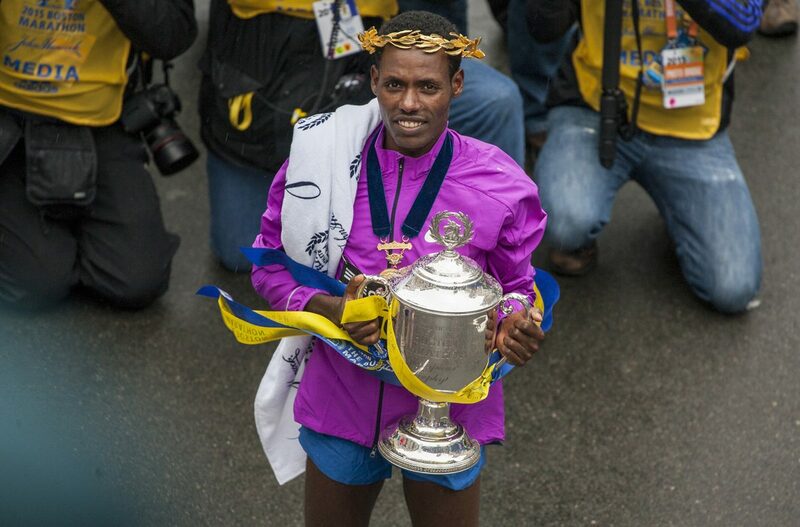 But he’s got strong competition this year from a field of talented African runners, including the 2013 champion Lelisa Desisa. 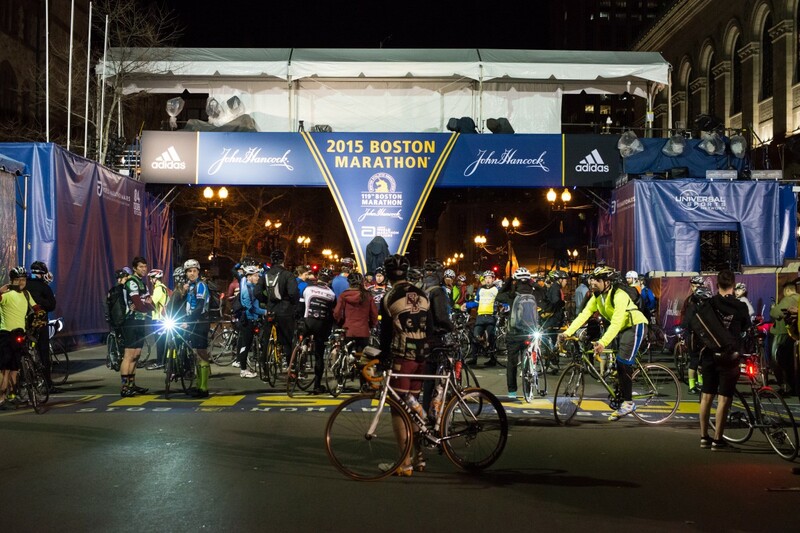 While you were sleeping, by the way, the annual Boston Midnight Bike Ride did its thing. Hundreds of bikers followed the route of Monday’s marathon, leaving Hopkinton at midnight and crossing the finish line around 2 a.m. You can see more photos here. The elite women are taking their places at the starting line, where they’ll set out 28 minutes ahead of the elite men and the first wave. Among the women is local favorite and Marblehead native Shalane Flanagan. 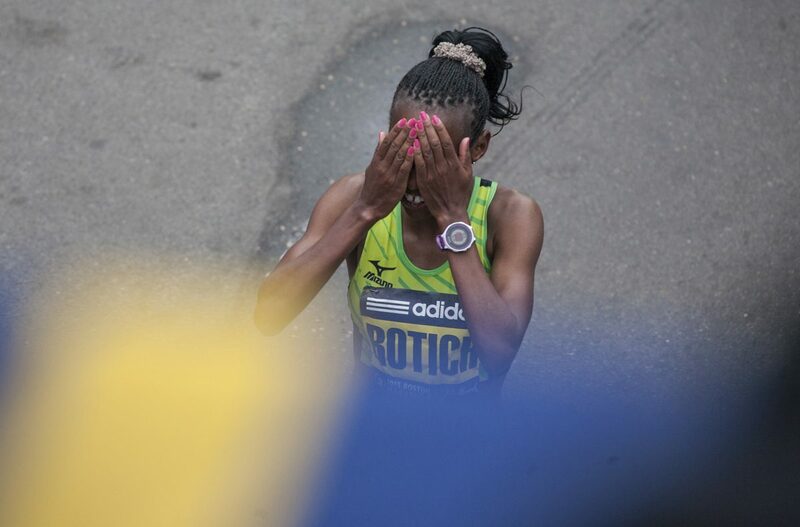 She’s struggled in past years to set a pace that could keep her in the lead through the full 26.2 miles, so her strategy will be one to watch this time around. If you’re stuck at your computer today, by the way, you can watch the race on the B.A.A.’s livestream here. The men’s pushrim race is on. Meanwhile, the women’s pushrim racers are lining up. 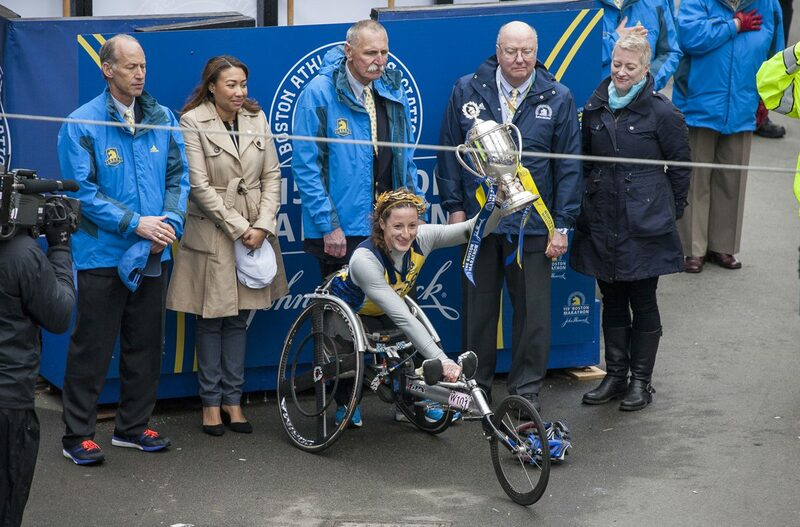 Their ranks include 2014 winner Tatyana McFadden and five-time champion Wakako Tsuchida. 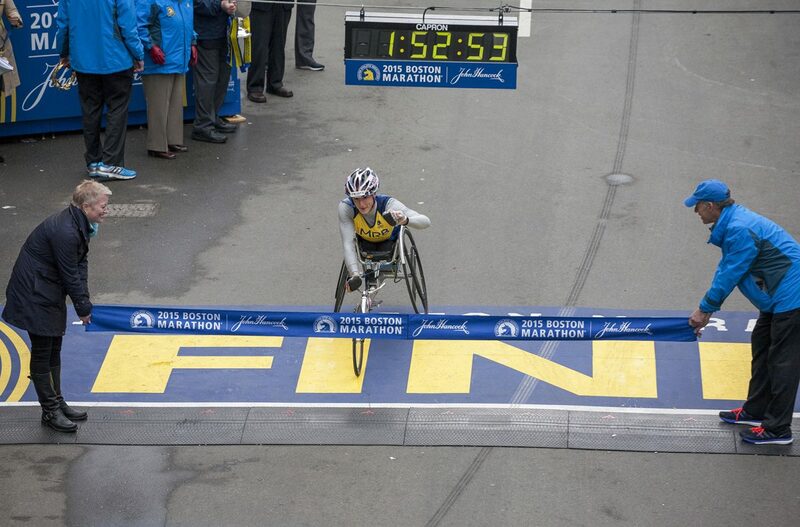 Mobility impaired racers have left the gate, meaning the Boston Marathon is under way(!) Meanwhile, the men’s wheelchair competitors are lining up. 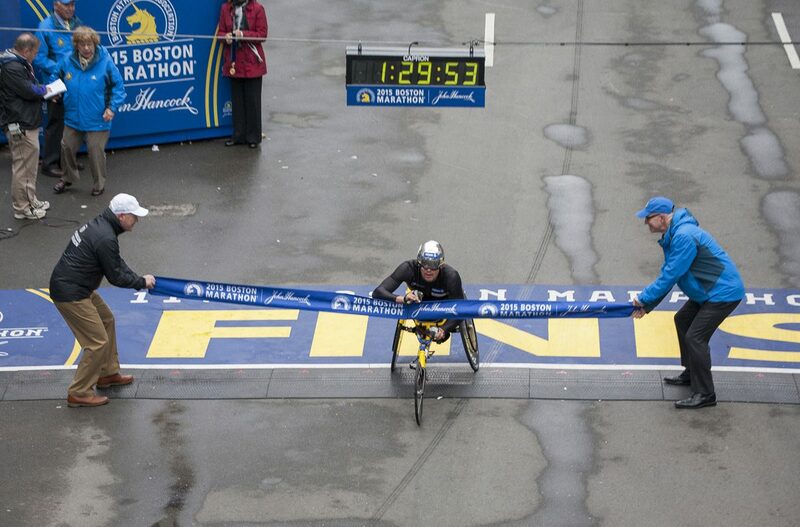 Look for Ernst Van Dyke, 11 time men’s pushrim wheelchair champion, and thus, a familiar face for Boston Marathon fans. 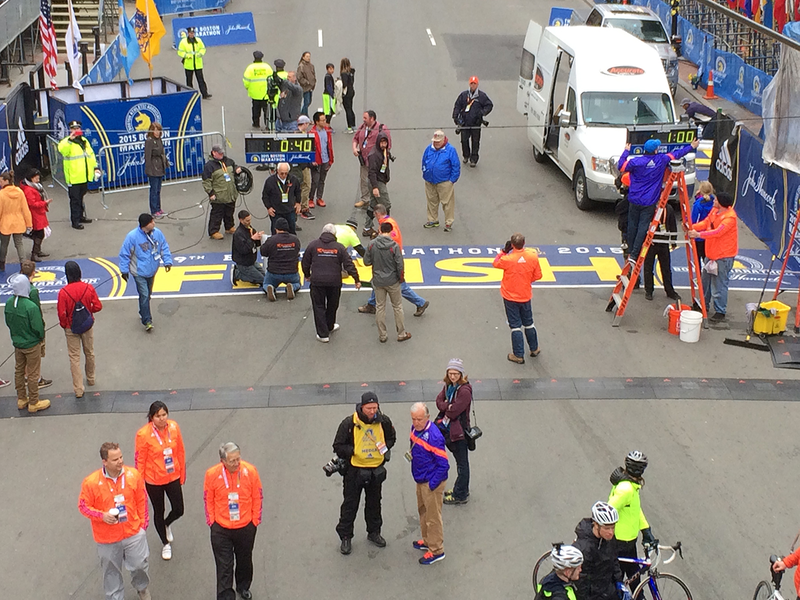 The first competitors are just leaving the starting line now, but 26 miles away, race organizers are finalizing things. 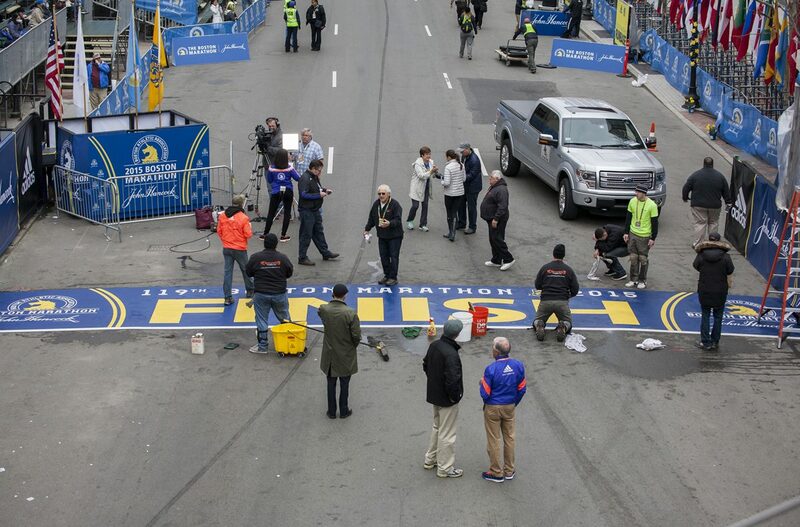 Here they are raising the race time clock. 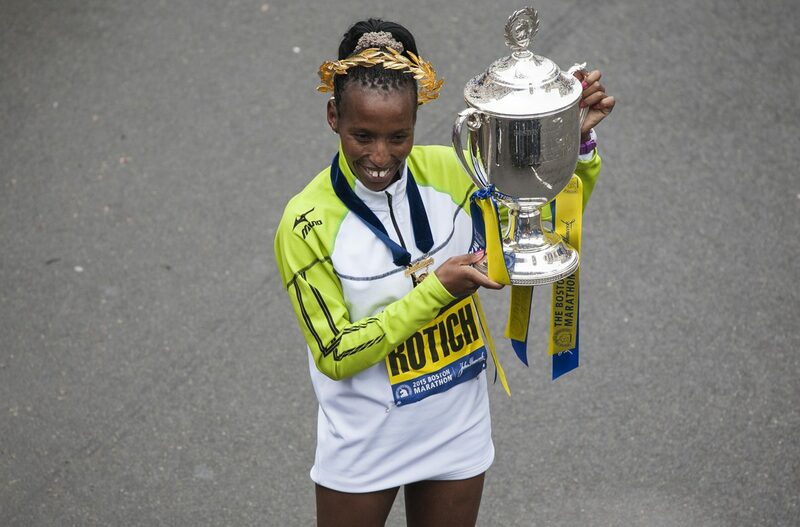 It remains to be seen whether the elite runners make any history today, but Saturday’s BAA 5K run sure proved one for the record books. Ben True and Molly Huddle, both prior winners, both set American records. True took first with a national record time of 13:22. Huddle broke the American record in 14:50. In the invitational mile, meanwhile, 18-year-old Ethiopian Dawit Seyaum set a course record in 4:35.4 Olympic silver medalist Dejen Gebremeskel won the men’s event in 4:04.1. Local students also competed in youth relays Saturday afternoon. 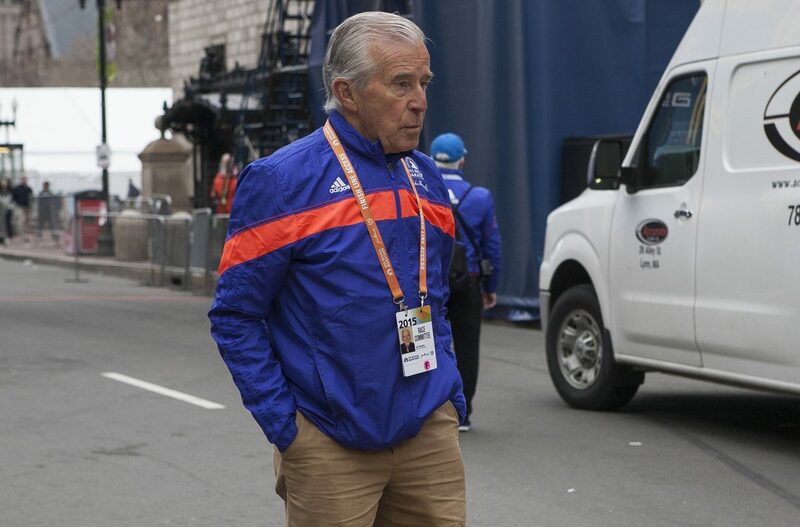 The weather report for Marathon Monday looks … less than ideal. 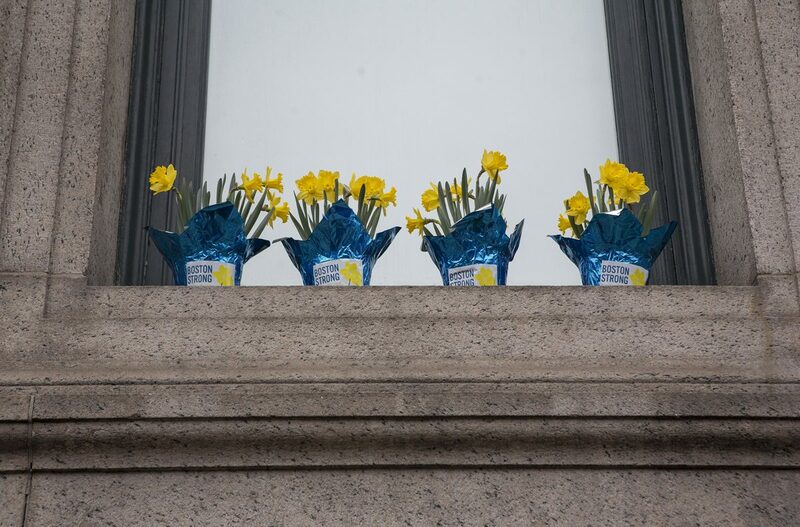 Meteorologists are predicting temperatures in the high 40s. 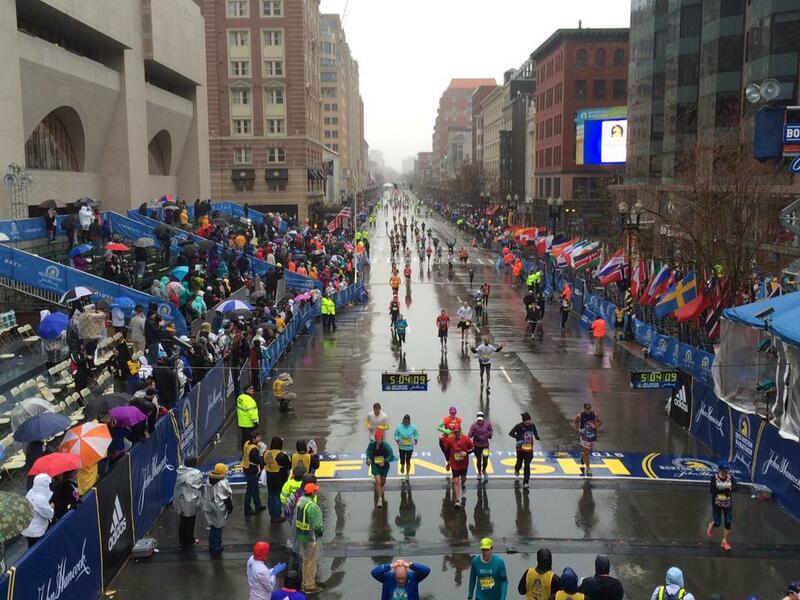 (Actually, though that’s not great spectating weather, it’s within a good range for the elite runners.) Worse, though, it will be windy with the potential for rain growing heavier through the day. 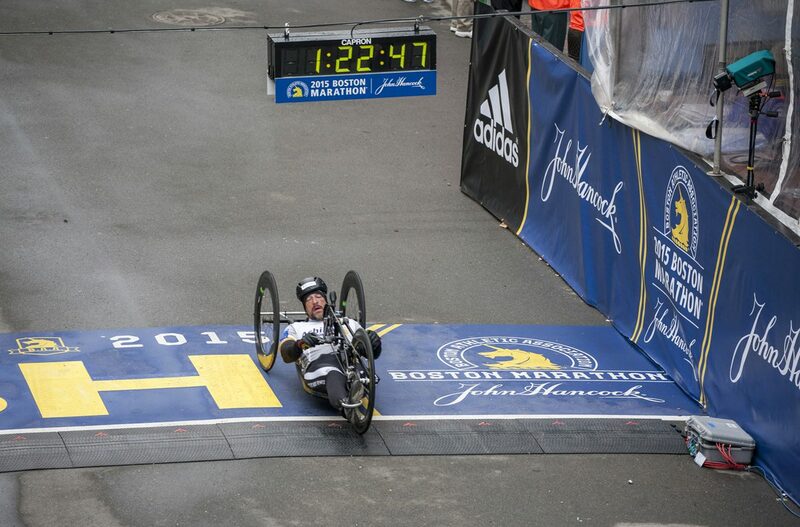 In terms of timing: The mobility impaired racers will start us off with a gun at 8:50 a.m. Then come the wheelchair-bound participants and handcycles. The elite women head out at 9:32 a.m. Sgt. 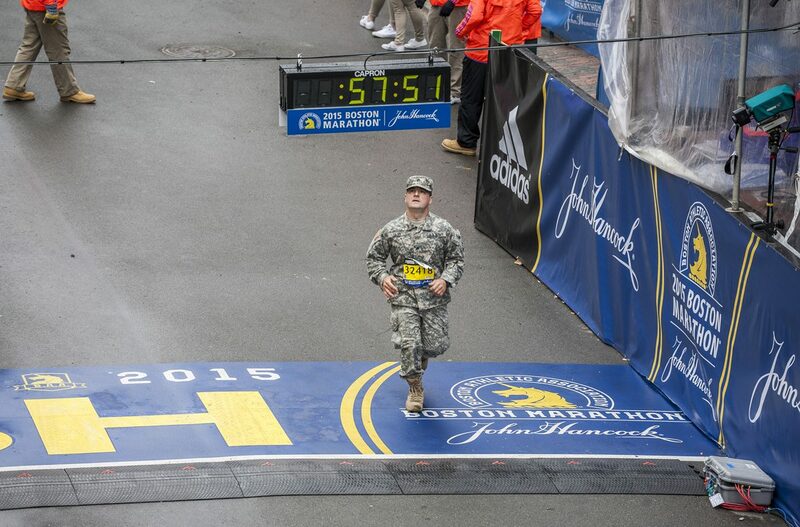 Daniel Clark will perform the national anthem at 9:48. Then elite men and wave one runners will start at 10 a.m. 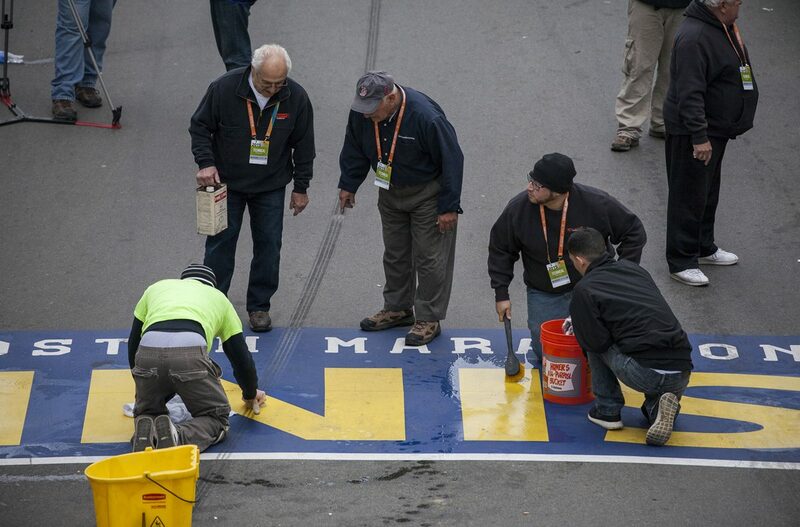 Welcome to our 2015 Boston Marathon live blog. 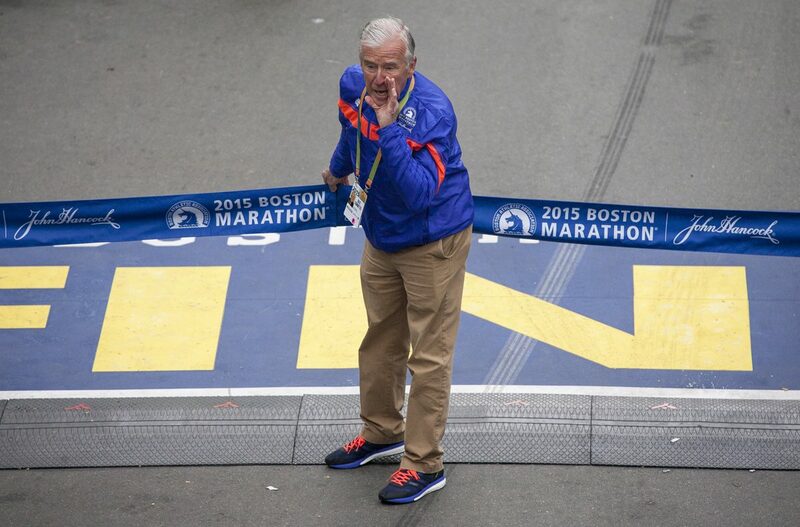 All day, we’ll update you with the latest from Hopkinton to Boylston Street. 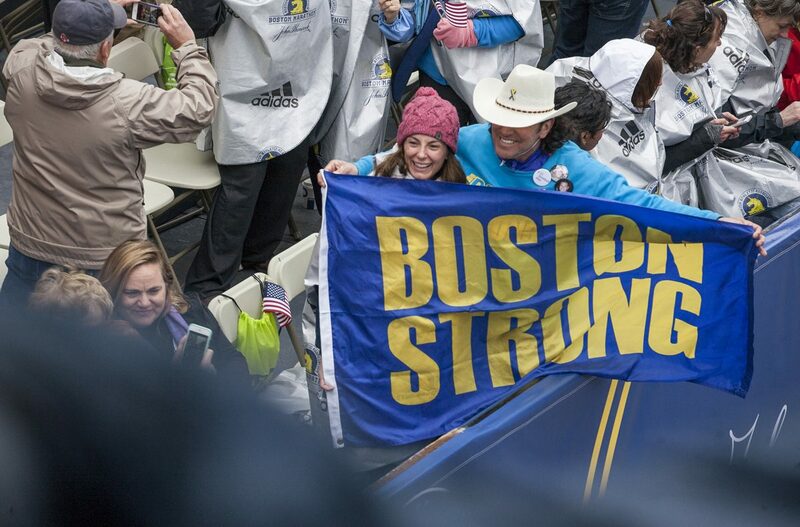 As thousands of athletes head to Hopkinton and engage in last-minute rituals (the mobility impaired division begins at 8:50 a.m.), check out our unofficial, irreverent, and completely idiosyncratic guide to Boston’s biggest day, “Your Guide to the Best Marathon Ever.” Here, you’ll find a mile guide with insider advice on popular viewing spots, as well as pro tips for spectators. 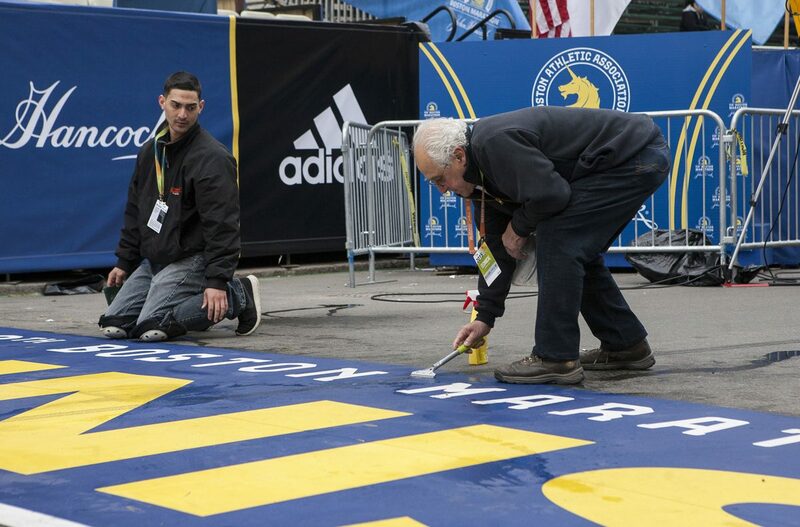 You can stream the race online at watchlive.baa.org, but stay with us for live updates on the 119th running of the Boston Marathon.